some of these bad boys. 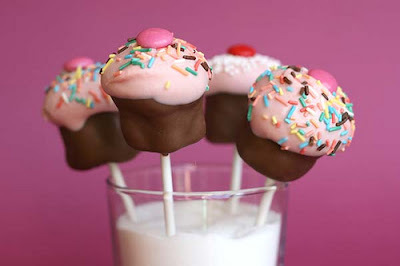 If you have never tried Bakerella's Cake Pops stay away! Because once you try them you will never be the same. Yes they are that good. And yes you will crave them too. Very scared. If I eat one, I might eat all 50 that come in the batch. Wow. My sister is obsessed with cupcakes. She is leaving to go to college tomorrow. My plan is to send her some kind of cupcake to eat every month. these are on my list. Thanks for the super cute idea!! !